AUSTIN, TEXAS (AP) — Arizona and Texas announced Friday that they would send 400 National Guard members to the U.S.-Mexico border by next week in response to President Donald Trump's call for troops to fight drug trafficking and illegal immigration. Arizona Gov. Doug Ducey said about 150 Guard members would deploy next week. And the Texas National Guard said it was already sending Guardsmen to the border, with plans to place 250 troops there in the next 72 hours as an "initial surge," according to a Guard spokesman. Two helicopters lifted off Friday night from Austin, the state capital, to head south. The total so far remains well short of the 2,000 to 4,000 National Guard members that Trump told reporters he wants to send. New Mexico Gov. Susana Martinez's office said Friday that it had not yet deployed any Guard members. The office of California Gov. Jerry Brown did not respond to questions about whether it would deploy troops. Trump's proclamation Wednesday directing the use of National Guard troops refers to Title 32, a federal law under which Guard members remain under the command and control of their state's governor. This leaves open the possibility that California's Brown could turn him down. Defense Secretary James Mattis Friday night approved paying for up to 4,000 National Guard personnel from the Pentagon budget through the end of September. A Defense Department memo says the National Guard personnel will not perform law enforcement functions or "interact with migrants or other persons detained" without Mattis's approval. It said "arming will be limited to circumstances that might require self-defense," but it did not further define that. Deployments to the border under former presidents George W. Bush and Barack Obama both occurred under Title 32. Bush sent around 6,000 troops in 2006, and Obama sent 1,200 Guard members in 2010. Trump's proclamation blamed "the lawlessness that continues at our southern border." Trump has suggested he wants to use the military on the border until progress is made on his proposed border wall, which has mostly stalled in Congress. After plunging at the start of Trump's presidency, the numbers of migrants apprehended at the southwest border have started to rise in line with historical trends. The Border Patrol said it caught around 50,000 people in March, more than three times the number in March 2017. That's erased a decline for which Trump repeatedly took credit. Border apprehensions still remain well below the numbers when Bush and Obama deployed the Guard to the border. News reports of a caravan of Central American migrants passing through southern Mexico also sparked angry tweets from the president. The caravan of largely Central American migrants never intended to reach the U.S. border, according to organizer Irineo Mujica. But Trump has repeatedly cited it as an example of what he called America's weak immigration laws. Department of Homeland Security officials have said Guard members could support Border Patrol agents and other law enforcement agencies. DHS Secretary Kirstjen Nielsen said this week that guard members could "help look at the technology, the surveillance," and that the department might ask for fleet mechanics. Federal law restricts the military from carrying out law enforcement duties. From 2006 to 2008, the Guard fixed vehicles, maintained roads, repaired fences and performed ground surveillance. Its second mission in 2010 and 2011 involved more aerial surveillance and intelligence work. Leaders in both Arizona and Texas said Friday that they were working with federal planners to define the Guard members' mission. The Arizona National Guard said in a statement Friday that it would "provide air, reconnaissance, operational and logistics support and construct border infrastructure." 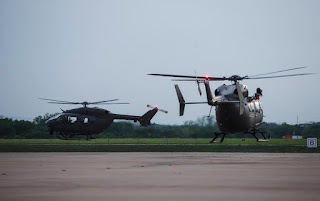 As the helicopters were taking off Friday in Texas, Guard spokesman Lt. Col. Travis Walters said that the 250 troops going "is what our initial surge is so that we can then very quickly roll in a larger amount of forces as needed." Walters did not specify where the first round of troops would be stationed. About 100 Guardsmen remain deployed as part of the existing state mission in Texas' Rio Grande Valley, the busiest corridor for unauthorized crossings on the southwest border. Former Texas Gov. Rick Perry, now Trump's energy secretary, originally sent about 1,000 Guard members to the border in 2014 in response to a surge in the number of unaccompanied immigrant children crossing the Rio Grande. Associated Press writers Bob Christie in Phoenix and Susan Montoya Bryan in Albuquerque contributed to this report. Nomaan Merchant reported from Houston.